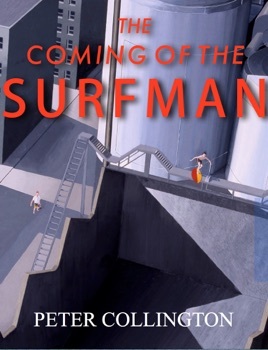 The Coming of the Surfman tells the story of a stranger who arrives in a rundown city neighborhood dominated by gang warfare and opens a Surfing Supplies store, despite the fact that the beach is a two-day drive away. First published in 1993 the book won the Fiera Di Bolgna Graphics Prize 'Special Mention' for Young Adults. Reissued as a graphic novel it has captured the imaginations of children, teenagers and adults alike. The Coming of the Surfman was included in Cityscapes, a Scholastic grade 5 teachers' source book used in elementary schools across the United States. In the United Kingdom it is used as a teaching resource in inner-city schools by The Learning Trust and is on the recommended reading list by the Centre for Civic Education: Literature for Children and Young Adults Examining Issues of Violence and Conflict Resolution. It is a National Literacy Strategy’s recommended text.